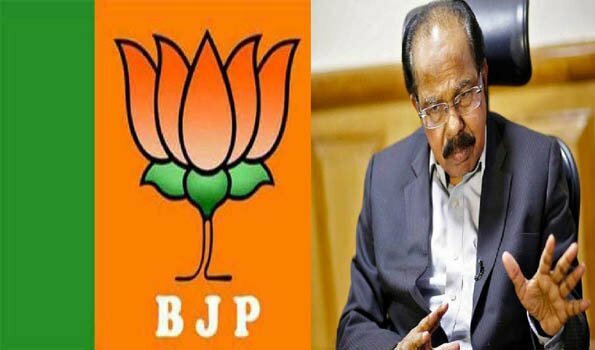 New Delhi: The BJP has stepped up attack against senior Congress leader M Veerappa Moily for his remarks against Chief of Air Force Air Chief Marshal B S Dhanoa and said the former Union Minister should tender an an apology. "Moily and Congress should tender apology from Dhanoa for remarks against the Air Force chief. The Congress is now targeting defence forces for cheap politics," BJP media in charge Anil Baluni said in a statement here. On Friday, Finance Minister Arun Jaitley has lambasted the Congress party for 'targeting' the chief of Air Force Air Chief Marshal B S Dhanoa and suggested that the grand old party needs to 'mature'. ".... by targeting the Chief of a Service in a political debate, the Congress Party has broken a long-standing unwritten rule of Indian politics. We keep our forces out of political discourse.....After having ruled this country for decades, the grand old party needs to mature," Mr Jaitley wrote in a blog posted on Facebook. "Unlike our western neighbour, it is non-political and non-partisan. We owe it to our armed forces the gratitude of having successfully defended this nation," wrote Mr Jaitley, who also held the portfolio of Defence for two brief spells. On Thursday, Mr Moily has accused Indian Air Force chief B S Dhanoa of "lying" in reference to latter's comment that the Rafale deal was a "game changer" and that the Supreme Court ruling dismissing petitions on Rafale deal row as a "very fine" judgement. IAF chief B S Dhanoa earlier in the day hailed the apex court judgement and had said: ?The Supreme Court has given a fine judgement. It took us so long that our adversaries have already upgraded their system. Rafale is a game changer.? The Congress, which has accused government of corruption on Rafale, has said that the Supreme Court was not the 'right forum' to look into the deal and hence a Joint Parliamentary Committee should be formed.